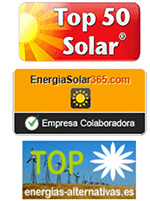 Self-Consumption Solar PV kits for Net Metering There are no products in this category. A Solar PV Kit allows us to reduce our electricity consumption by generating our own electricity. While our consumption is greater than or equal to the generation of our Solar Kit, electricity will flow all into our house. By the time the electricity is greater, if we register as power producers, we can sell this energy at the price set by the market. Installation can be large we want, but keep in mind that is better self-consume than sell because the price we’ve been paid for that energy is lower than the price it costs us to buy it. A Solar PV kit for grid connection allows us to be self-consumers of the electricity that we produce and sell our surplus to the electricity grid (if these are considerable), thereby obtaining a yield per kWh generated by our solar system. Besides being economically beneficial, by acquiring a Solar PV Kit for grid connection we are working with the implementation of a sustainable and respectful system with the environment for the generation of our energy needs, allowing reduce our negative footprint and our impact on the environment.